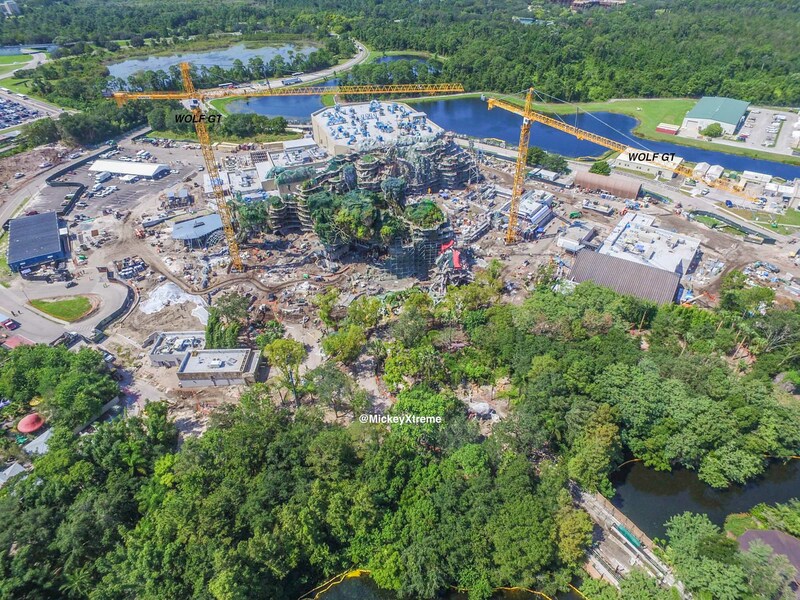 A new set of photos from @mickeyxtreme give us a great look at Pandora – The World of Avatar from the air. Let’s dive in. 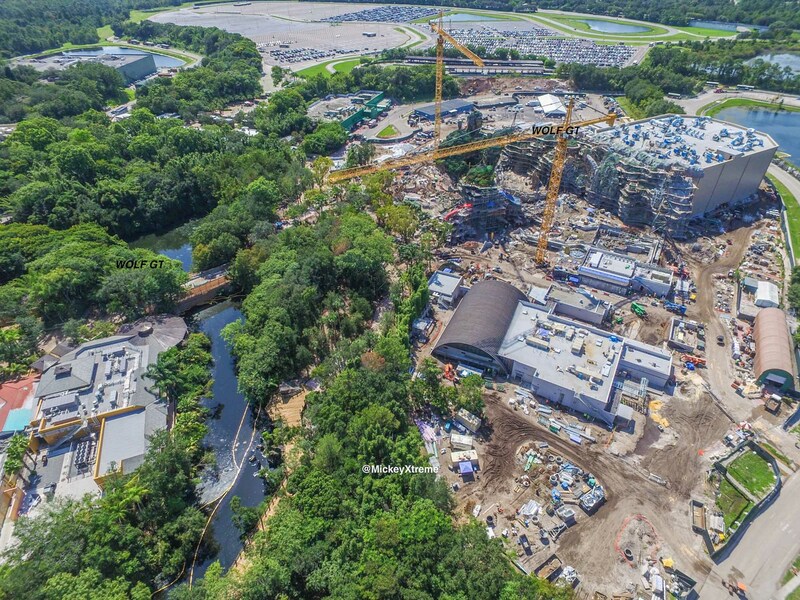 This first photo gives us a good look at the enormous show building on the left, what appears to be a temporary trailer in the bottom right, and Rainforest Cafe on the far right (painted green). 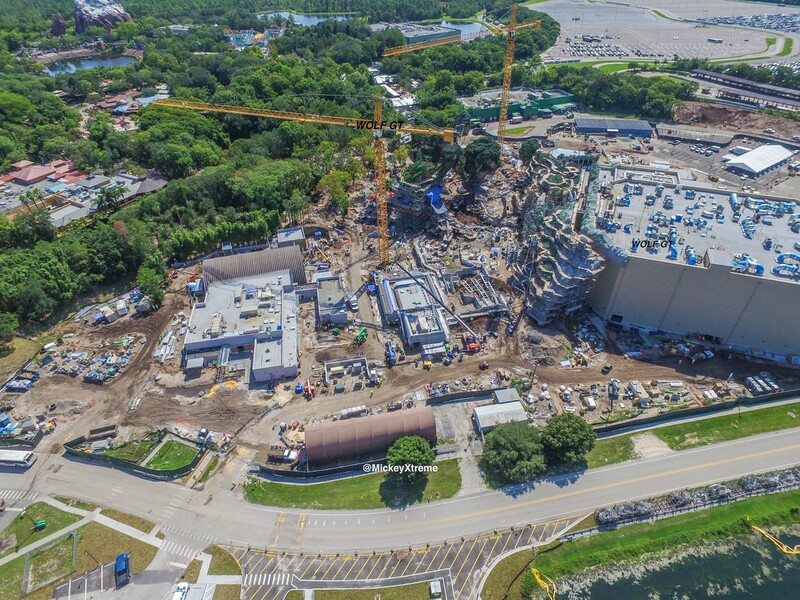 Here’s a look at the backside of the facade that will hide the show building from those guests who are walking around in the land. Of interest in the above photo is the building with what appear to be glass panels on the roof. 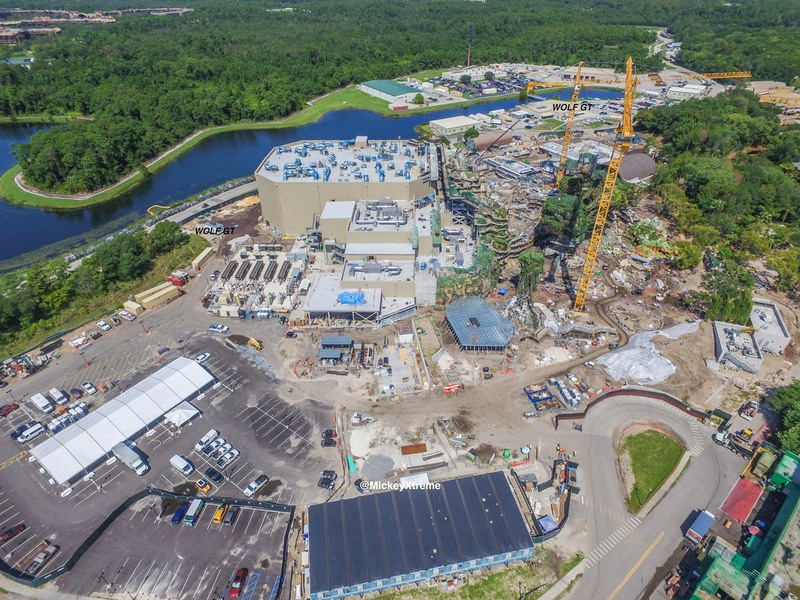 We’re not quite sure what this would be, but it is near the part of the show building that will house the water ride, based on permits. Also of interest is what appears to be a cement trough of sorts in the middle of the picture. It is possible that this could end up being a water feature of sorts. 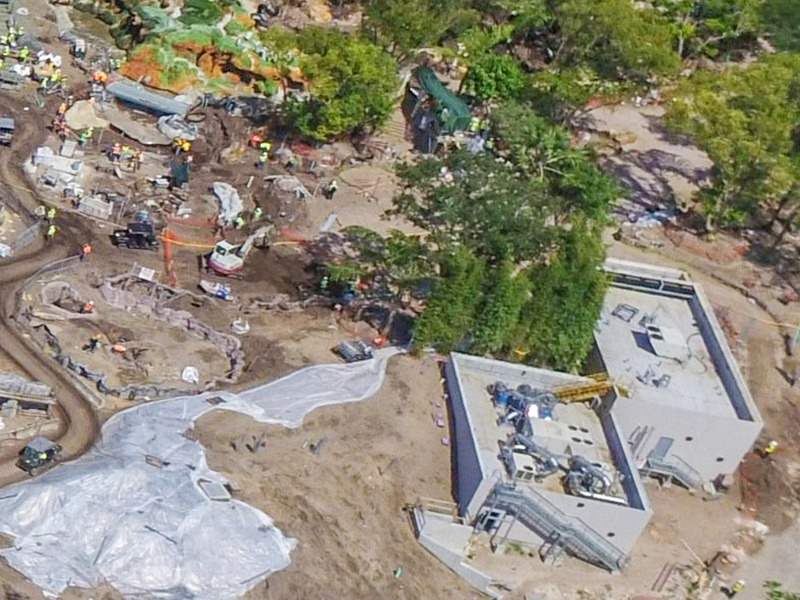 Here’s another overview of the land. 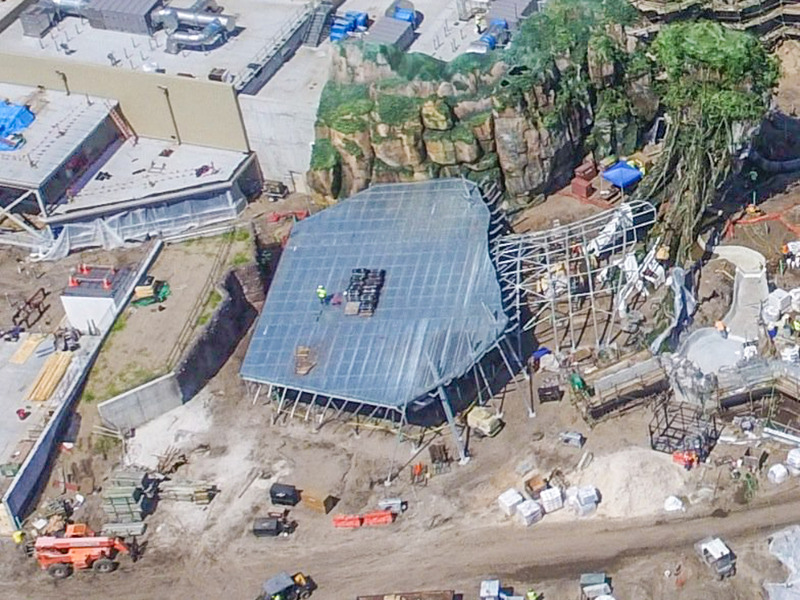 We notice the show building again, along with the odd glass-ceiling building. 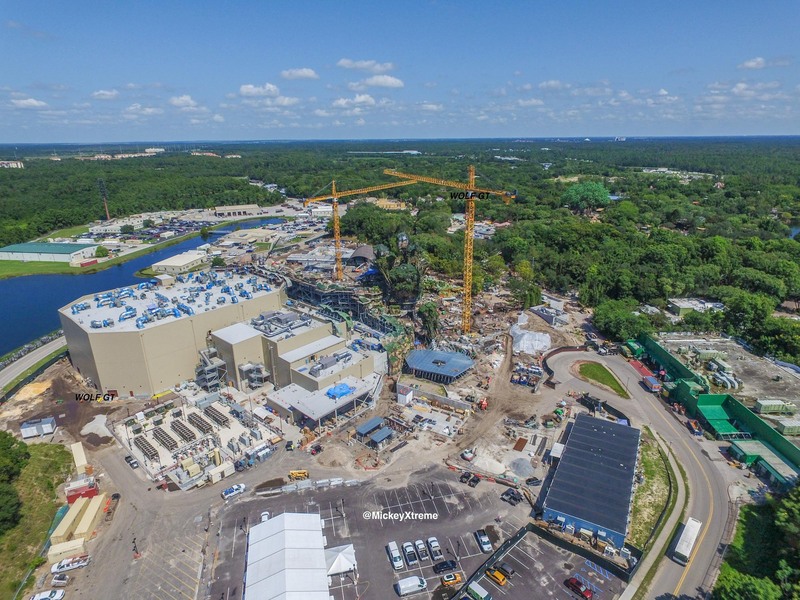 On the bottom-right of the image is the Cast Member bus loop. Oh, what we would give to be on that bus. Just past the bus loop are two buildings that are said to be restrooms. 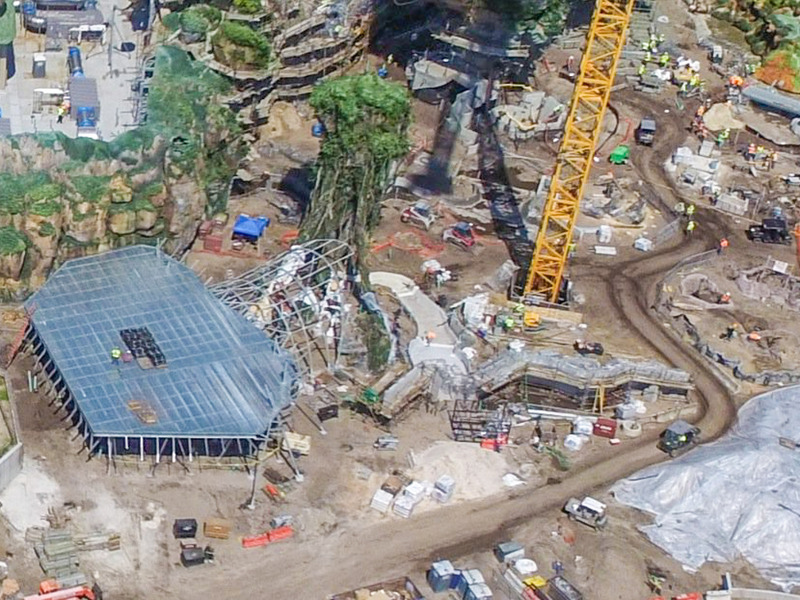 A closer look at the restrooms shows the foliage that is used to hide our view from the ground of the progress. 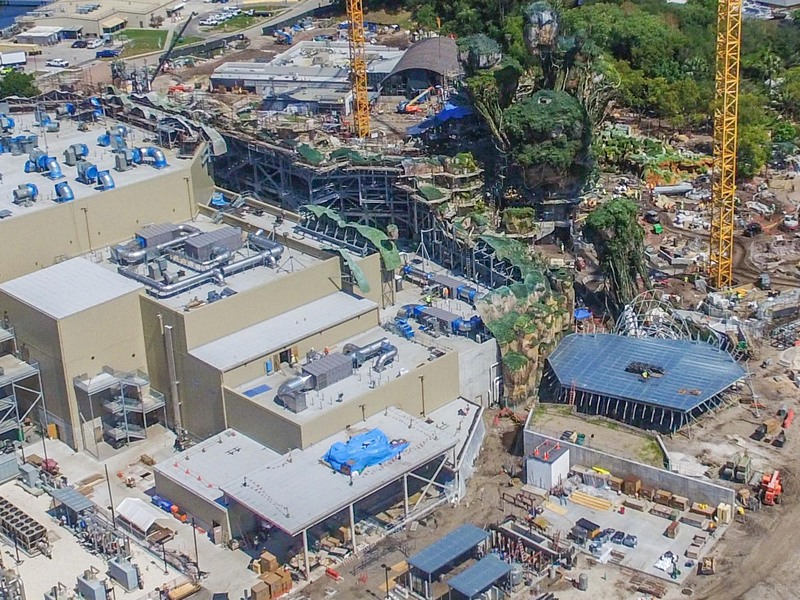 This overview gives us the best look at what guests will see upon entering Pandora. The bridge at the bottom right of the image is the entrance next to Tiffins. The building with the corrugated metal roof on the right will be the mess hall restaurant serving the new land. The buildings to the middle left of the image are said to be restrooms. 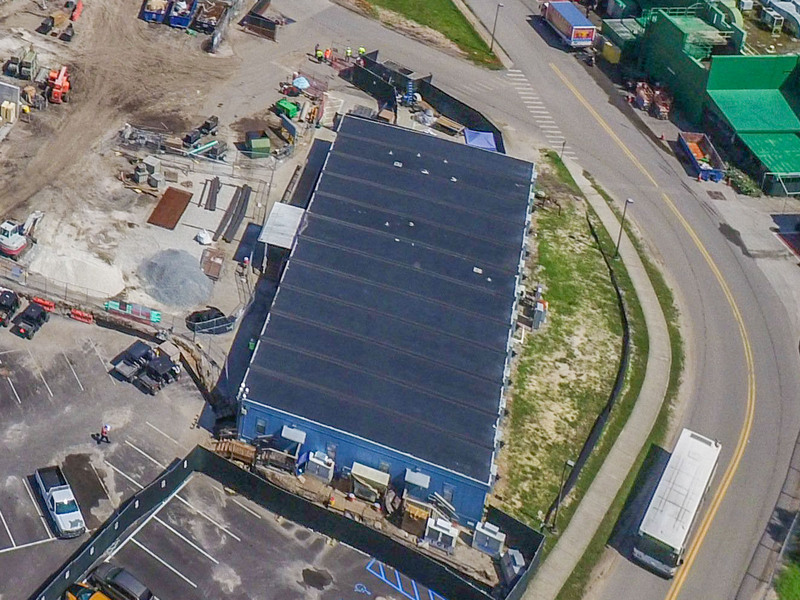 This overview gives us a better look at the mess hall, under the corrugated roof. To the left of the river, we can see the Tiffins building. 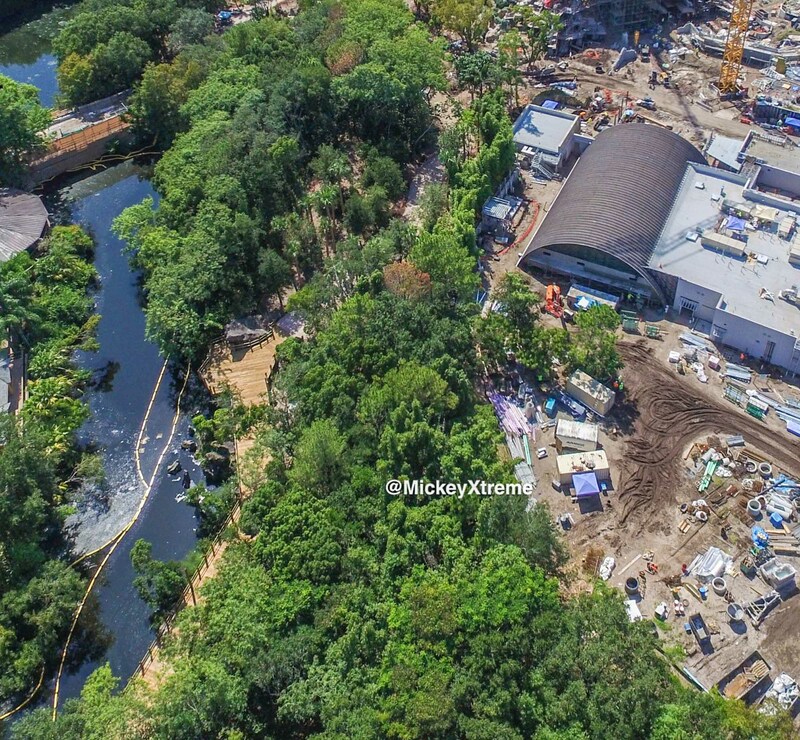 A closer look at the above image shows the boardwalk that will be an entrance from near the Festival of the Lion King in Africa. The final angle shows two interesting things. 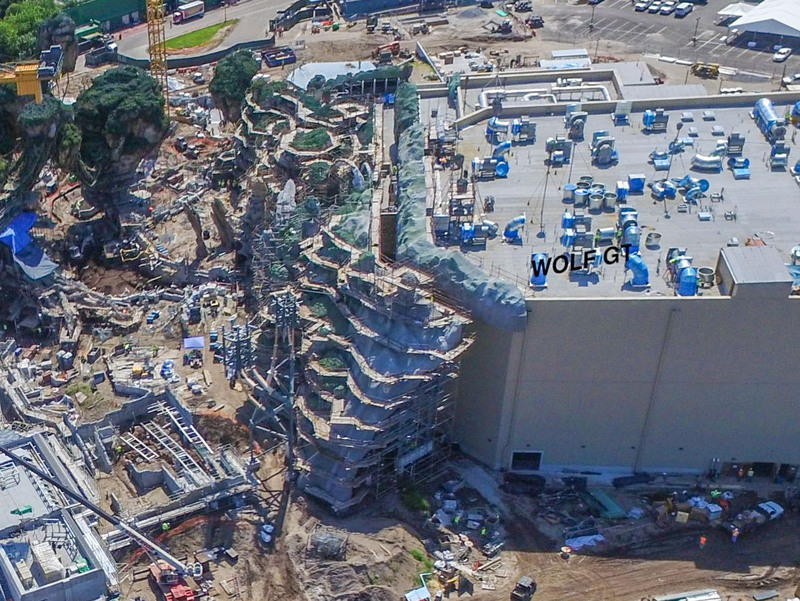 First is that the facade doesn’t appear to be actually attached to the show building. This would make sense as Disney would want both to be freestanding structures and not put any unnecessary stress on the other. The second bit of interesting info we can gather from this photo is the amount of multi-level sections of development. The middle-right of the image shows a bunch of different levels of grading that will hopefully provide a very diverse amount of gradient and lead to a more believable experience of walking amongst floating mountains. As always, we’d like to thank @mickeyxtreme for posting the images on Twitter! What is the building in the center of that last picture? 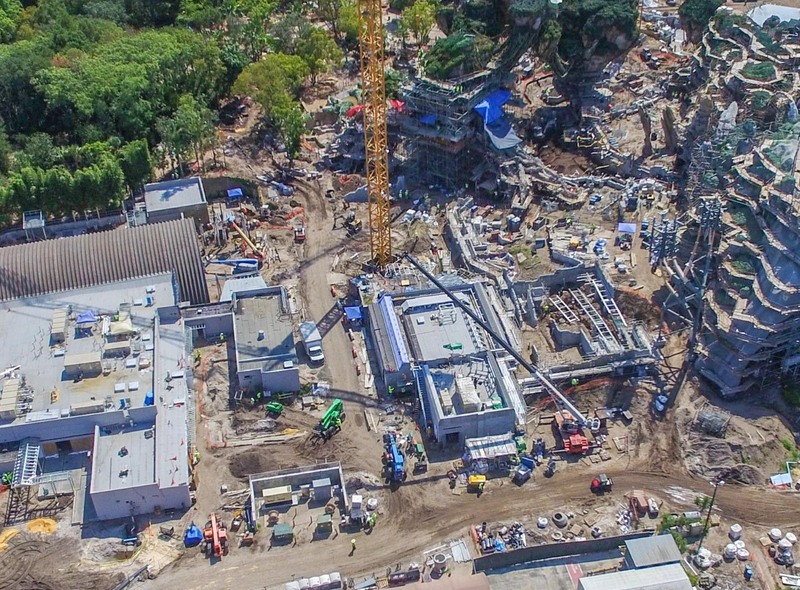 I know the building on the left is the mess hall and the big building on the right is obviously the show building for the flying attraction… but wondered what that middle building is. My guess is that it is probably a store.. but also wondered if it could be the beginning of the queue for the flying attraction. Where is the water ride ?? ?